A graduate student from Northridge University, Diane Powell, contacted me with some intriguing questions about Morro Creek. She was working toward her masters' degree. She was interested in the physical geography including the watershed of Morro Creek Basin in the mid 1900's. Earlier this year in a meeting with some Historical Society members, the subject of Little Morro Creek was raised in conjunction with harbor development during WW2. Diane's principal question was whether Morro Creek had been diverted to its present location in the mid 1900s. Since I didn't know, I talked to two very knowledgeable people about Morro's history, Howard Caccia and Pat Nagano. 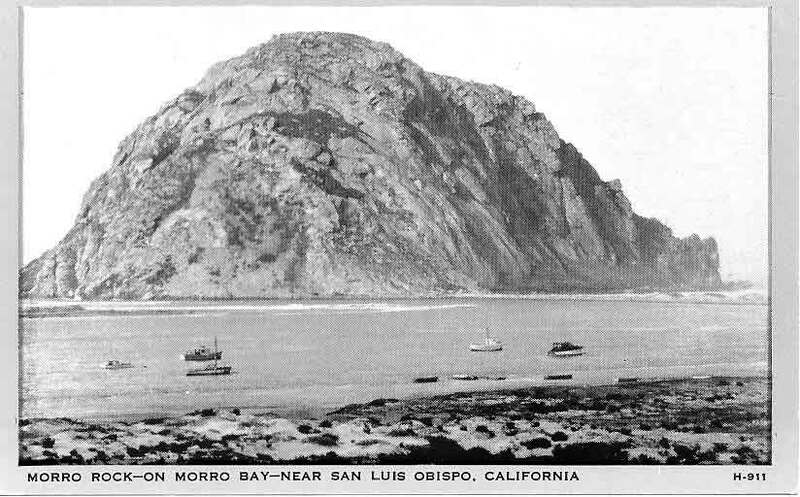 Both said that Morro Creek had always run into the ocean north of Morro Rock. Pat Nagano said that at some point there might have been a diversion of Little Morro Creek into Morro Creek. John Marques and Al Jorge both remember Little Morro Creek running into the bay before WW2. An 1890 map of Diane's did depict the creeks becoming confluent at the same location as today. This poses the question, what was running into the bay? An early postcard, provided by Loren Nicholson may hold a clue. In this photograph, it does appear in the foreground that there is a small creek running into the bay. In summer months, it would be very small as depicted here. The enlargement of the foreground area (below) is a better representation. This small "creek" is located approximately in front of the present power plant on the embarcadero. Depending upon the time of year this creek might be a swift stream or nonexistent. Next to Quintana Road is another much smaller watershed that also contributed to the wetlands and willow tree overgrowth. Today it runs into the PGE (Duke) property and disappears. Please note that in the larger photo, work seems to have been completed in closing off the North entrance to the harbor, as rock removal is evident (from Morro Rock). As mentioned elsewhere, the area at the base of the hill extending north to present Highway 41 was flooded in 1940--1941 and probably many times before. Much of this entire area and extending almost to the bay was known as the Willows. Here, some families lived and others camped from time to time so there was some high ground. It seems obvious that where the two creeks intersected there was constant overflow during the wet years creating not only the Willows, but possibly Carp Lake as well. When the Navy base and later the PGE plant was built, various dams of sorts were probably created to keep the water channeled in one creek. This seems to have worked reasonably well except in very wet years e.g., the "el nino" of February 1982 when flooding occurred in an adjacent trailer park as well as many other places. In the late 1800s, landowners were required to maintain roads across their property. This led to a variety of poorly maintained trails that were mostly unfit for travel. Trade from Cambria and San Simeon was principally by vessel as creeks and swamps made it difficult to get to San Luis Obispo. When decent roads were completed, and San Luis Obispo emerged from pueblo status into a railroad town, (now a prison/college town) the shipping industry died out and was replaced by travel over land. After walking much of the area with Al Jorge, Wilbur Sowel and Jack Poe we pretty much agree that when the embarcadero was filled and the Willows cleared, the broad watershed at the foot of the hill, with drainage into the bay, was blocked by a damming at the junction of the creeks.